Alright, the last time we were at Golden Swan, it was for Dim Sum and to be honest, it was a disappointment. In fact, I was disappointed in being disappointed because Golden Swan was part of my childhood. You see, the restaurant known as Golden Swan began back on Nanaimo Street as Golden Phoenix. We'd go there for Dim Sum and dinner all the time when we lived in that neighbourhood. Yes, there is a Golden Phoenix there right now; but it's not the same Chinese name or ownership. The original owners of that restaurant opened a small one unit restaurant on Victoria called Golden Swan. Within the same little strip mall, there were a few other businesses including Baskin Robins. Slowly, but surely, they took over one unit at a time and finally it exists as we know it today. I've been a customer of Golden Swan for quite some time and it was nice to see we'd return for dinner tonight. It was my nephew's 1st birthday and we were going to have quite a feast tonight. I was seriously hoping that the meal would be better than the last time we visited. Although this dinner was neither a wedding nor a baby one-month, the set menu remains pretty consistent. Thus, we started off with an Appetizer Platter which consisted of Honey Garlic Spareribs, Marinated Jellyfish, Pork Hock, Marinated Beef Shank and Fried Shrimp. Well, nothing much to complain about here. The spareribs were crisp with just the right amount of sauce while the fried shrimp were just cooked. 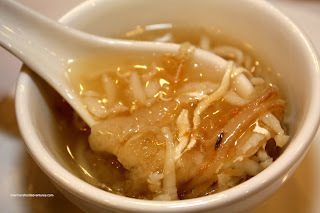 The jellyfish was well-seasoned with sesame oil and soy while exhibiting the desirable crunchy-chewy texture. The obligatory Crab Claws stuffed with minced shrimp were next. 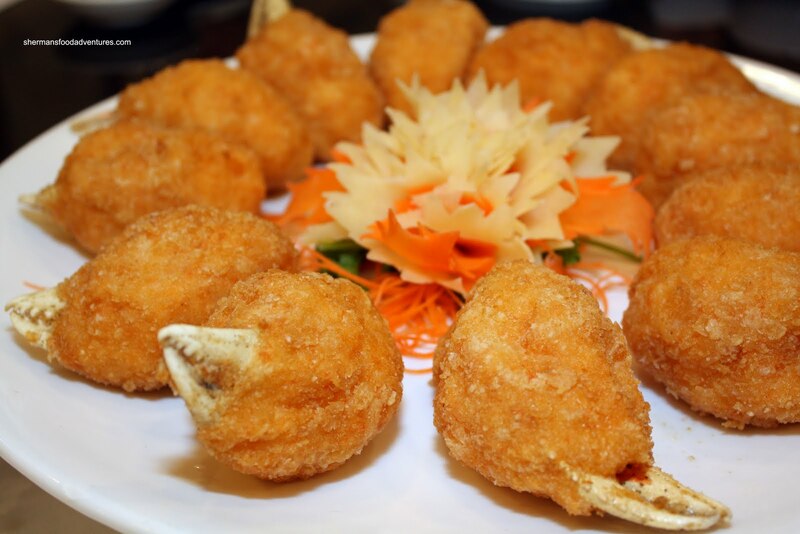 These were perfectly fried with a light crisp exterior with soft, moist shrimp. Impressively presented, the Bird's Nest was actually full of snap peas while all the seafood rested on top. 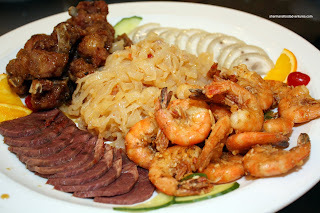 Despite this optical illusion, there was still plenty of shrimp, scallops (slightly overcooked) and squid. Our soup for the meal was 2 Types of Fish Maw Soup (fa gow & yew toh). Fish maw is the air bladder found in the body cavity and helps fish balance. 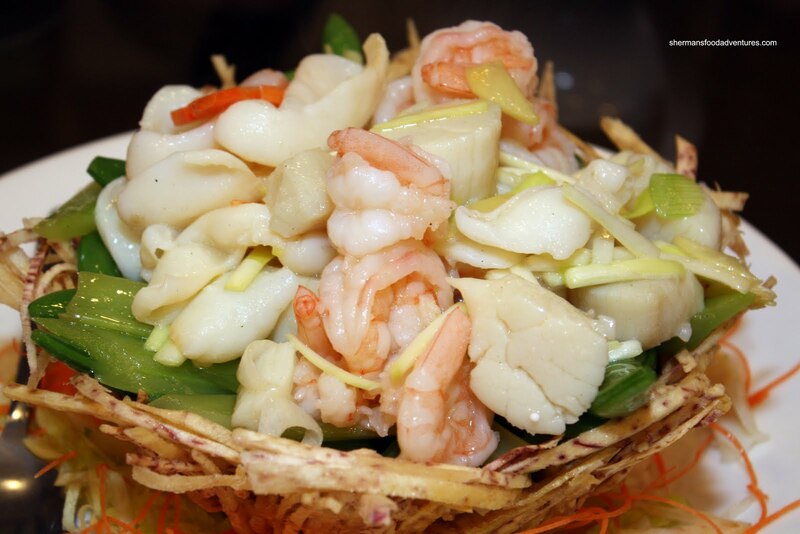 Fa gow is the dried variety while yew toh is fried. In the picture, the darker strips are the fa gow. It's much more gelatinous and firm. There was no shortage of either fish maw, chicken within the luxu rious; yet lightly seasoned broth. Next up, as expected (these types of menus are pretty standard) was the Lobster in supreme broth. Supreme sauce is essentially an English name for "seun tong" or premium chicken stock (might be made with such items as dried scallops etc...). Well, nothing much to dislike here. The lobster was fried up nicely with sweet juicy meat and there was just the right amount of savory sauce. Sometimes you get a pool of sauce at the bottom; but there was just enough to coat each piece. 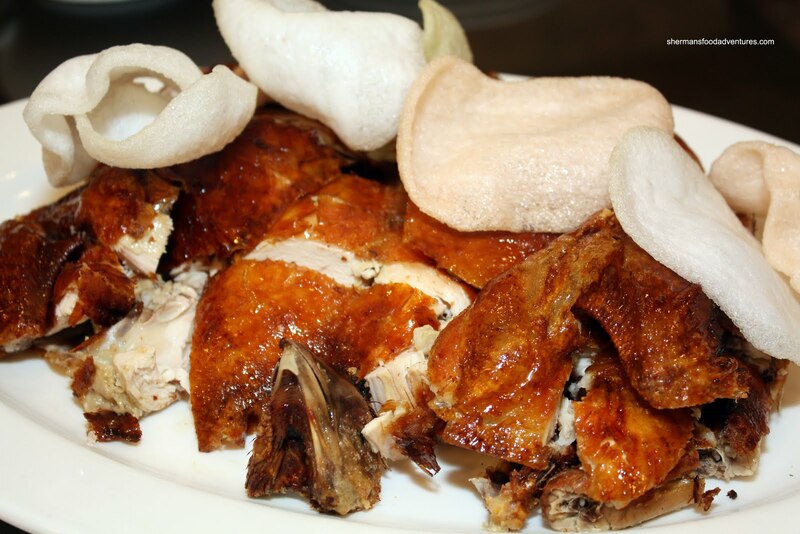 If you've ever been to one of these meals, you'll know that the Crispy Fried Chicken is next. I find that this dish is actually quite hard to do right despite its simplicity. I've helped make this at my friend's restaurant and to ensure a crispy exterior while maintaining a juicy, moist interior is very difficult. This particular attempt here was pretty good. Most of the meat was still moist (the white meat was a tad dry) while the skin was crispy. We liked the shrimp chips as well since many restaurants are moving away from serving it with the crispy chicken. 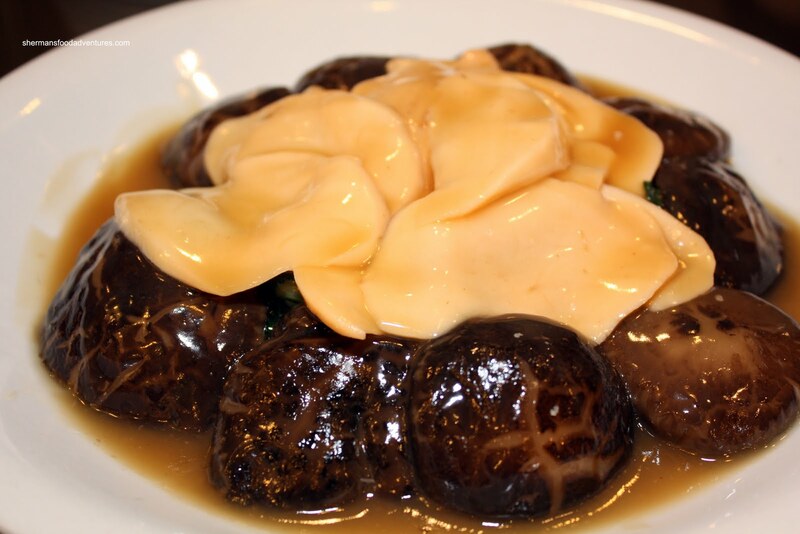 One of the real treats of any Chinese "banquet"-type dinner is the Abalone with Shiitake Mushrooms. At first glance, abalone doesn't appear too look like much and flavour-wise, it's quite delicate. The thing about abalone is the texture. It's quite meaty and chewy; yet soft enough to eat at the same time. But honestly, another major reason that abalone is so treasured is that it's quite hard to attain. Hidden in the deepest parts of the ocean, people die to harvest them. 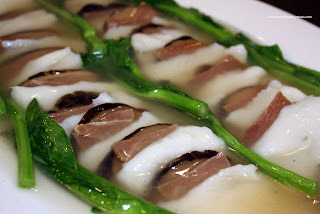 So to some, abalone is nothing special. For me, I like it; but there are other things I'd eat before it. In this case, it was pre pared correctly while the dried shiitake were stewed to the point of being quite tender without breaking apart. Now to the fish dish. Sometimes, you'll see a whole steamed fish, maybe a fried fish (ugh!) and this time it was Steamed Sole with Virginia Ham and Shiitake Mushrooms. Since the ham is inherently quite salty, there wasn't a big need for a flavourful sauce. The thickened chicken stock sauce was quite light and the ham did its job on the delicate fish. A solid, if not unexciting dish. 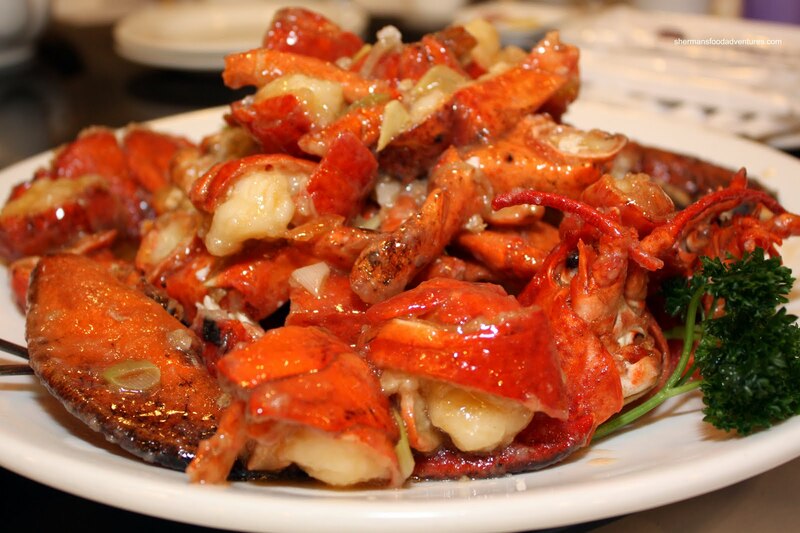 With any banquet-type menus, the 2 filler dishes come at t he end. Normally, we have a noodle dish and a rice dish. 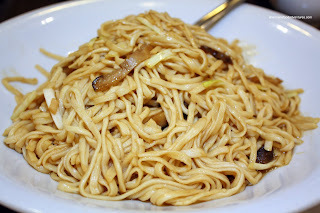 And just like 90% of the time, we got the Fried Yee Mein with shiitake and flowering chives. Maybe lacking a bit in "wok hay", the noodles were still a bit chewy (which is a good thing) and only moderately seasoned with soy. Not too wet and not too dry, this was a pretty decent attempt. 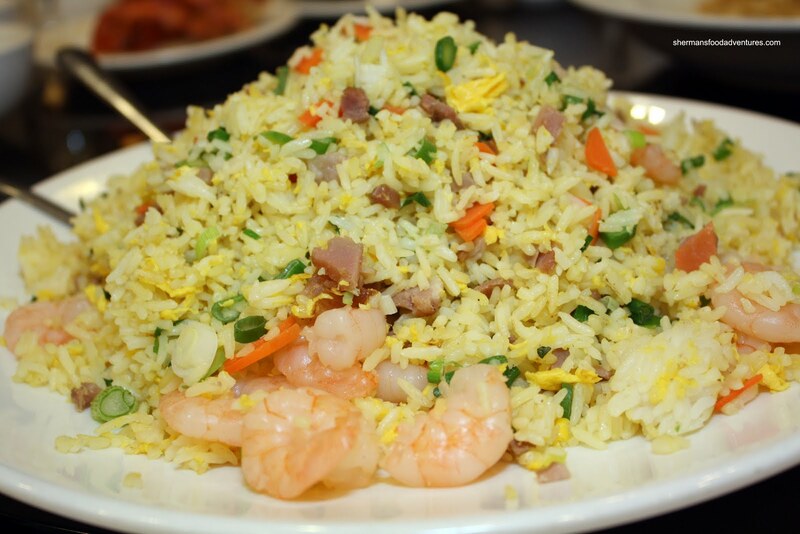 As for the other dish, we got Lucky Fried Rice, which is a variation of the Yeung Chow Fried Rice (Shrimp & BBQ Fried Rice), which added carrots and gailan stems. Visually appealing with plenty of crunchy shrimp and other ingredients, the rice was decent. A few clumps of rice here and there; but overall the rice was dry and lightly seasoned. Compared to the Dim Sum lunch I had a year ago, this dinner was definitely more satisfying. Nothing stood out as being subpar while at the same time, it wasn't spectacular either. But then again, for a mid-level Chinese restaurant which is both spacious and relatively clean, it more than did the job. Maybe I need to revisit during Dim Sum to see if that awful visit was an aberration. Thanks for the history lesson on Golden Swan. I'm in the neighbourhood and never knew its past. how do you know about this history? Do you have a log of some sort? Hi Anson, there are a couple reasons I know. First and foremost, my cousin is friends with the owner. Second, we were good customers prior, so we knew the whole story.